Irregular convection cells transfer heat from the Earth’s core to the surface. Convection is the driving heat engine that powers the motion of the Earth’s great tectonic plates. Plate tectonics is the Earth’s way of expelling heat to space, thus fulfilling its obligation to the Second Law of Thermodynamics. Cross-section through an active subduction zone adjacent to a continent. Note the continental volcanic arc rising parallel to the subduction zone. Cross-section through an oceanic subduction zone. The older lithospheric plate dives beneath the younger, lighter plate. Partial melting of the descending plate produces hot plutons of molten rock moving toward the surface. When they reach the surface, they erupt to form a chain of volcanic islands. Geologic processes that operate on a global scale have profoundly affected the Pacific Northwest. By understanding just a few of these processes, you’ll be equipped to tackle Washington’s geologic history. We place special emphasis on the basic processes of plate tectonics responsible for the evolution of Washington and the Pacific Northwest. Finally, we introduce the geologic time scale – a chronology of Earth and life history. In composition, the Earth is made of three nested spheres. At the center of the Earth, a body of intensely hot iron and nickel forms the core. A less dense and much larger middle sphere is made of materials rich in iron, magnesium and calcium and comprises the mantle. The outermost layer is a thin veneer of lighter rocks and is called the crust. The crust beneath the oceans is composed of heavy, dark volcanic rocks such as basalt. Continental crust is composed mostly of lighter rocks rich in silica, such as granite. The Earth’s interior also has distinct physical layers without regard to composition. The outer layer is comprised of a rigid sphere called the lithosphere (“rocky sphere”). The lithosphere includes the upper, solid part of the mantle and all of the crust. The lithosphere is floating above a zone known as the asthenosphere (“weak sphere”). The asthenosphere behaves as a hot, ductile plastic. (core, mantle and crust) and physical layers (lithosphere and asthenosphere). To fully understand how the Earth changes, it is important to appreciate the basic distinction between crust and lithosphere. The crust (both continental and oceanic) is the thin layer of distinctive chemical composition overlying the mantle. Very different processes form oceanic crust and continental crust. Oceanic crust is much thinner (typically 4 – 5 miles thick) and heavier than continental crust, which can range from 21 to nearly 30 miles thick. The lithosphere, in contrast, is the rigid outer layer of the Earth. It differs from the underlying asthenosphere by its physical and mechanical properties rather than its chemical composition. The lithosphere responds essentially as a rigid shell whereas the asthenosphere behaves as a very thick fluid. The diagram above illustrates both the chemical and physical layers within the Earth. As you go deeper into our planet, the conditions of pressure and temperature steadily increase. The rocks become hotter and denser the deeper you go. The weight of all the overlying rocks causes the increase in pressure. The decay of heavy radioactive elements like uranium deep in the core produces the increase in heat. Nature is always uncomfortable with any unequal distribution of heat. It constantly works to equalize any temperature difference in the most efficient way possible. The Earth has a basic obligation to the laws of physics to transfer its internal heat into the cold universe that surrounds us. Because the interior of the earth is hot and under great pressure, it transfers much of its internal heat by a phenomenon called “convection.” Convection is the process by which hot materials rise, move laterally, cool, and then descend, in a cycle. You can see convection operating in a pan of boiling water. When water reaches a rolling boil, hot water rises in the center, cools as it spreads across the surface, then descends along the outside of the pan to complete the cycle. These cycles are convection cells. Within the Earth, irregular convection cells within the mantle transfer heat from the core to the surface of the planet. This mechanism is the driving force behind both heat transfer and the global processes of plate tectonics. Tectonics is concerned with movement in the Earth and the forces that produce movement. Plate tectonics is the theory that the Earth's lithosphere (outer rigid shell) is broken into a dozen or so rigid "plates” that float on the hot, ductile mantle like slabs of ice on a pond. Much of the Earth’s ancient history is the result of plates rifting into pieces to form new ocean basins and converging back together to form mountains and giant continents. Plate tectonics is the great unifying theory of geology. Virtually every part of the earth's crust and every kind of rock relates to the plate tectonic conditions that existed at the time it formed. There is very little in geologic history that makes sense except in the light of plate tectonics. The rigid lithospheric plates differ in size, direction of motion, and in the type of crustal rocks included in the plate. Some plates (such as the Pacific Plate) are completely covered by oceans and are made of oceanic crust. Other plates (such as the North American Plate) carry continents and adjoining pieces of the ocean floor. The map below shows the global distribution of lithospheric plates. Notice how the North American plate includes both continental rocks and oceanic rocks of the Atlantic Ocean. The Pacific Plate, in contrast, carries only oceanic crust. Closer to home, notice the Juan de Fuca Plate offshore of Washington and the Cocos Plate adjacent to Mexico and Central America. As we’ll see, the Juan de Fuca and Cocos plates are the last remnants of a once huge oceanic plate (called the Farallon Plate) largely destroyed beneath the North American continent. The Farallon Plate and its descendants played a major role in the geologic evolution of Washington and the Pacific Northwest. 1) Divergent boundaries - mid-ocean spreading ridges that generate new oceanic crust. Because the plates are pulling apart, these are “extensional” boundaries. 2) Convergent boundaries - where one lithospheric plate dives under another in a process called subduction. These are “compressional” boundaries. 3) Transform boundaries - where plates slide horizontally past each other along giant faults. California’s San Andreas fault is the best-known transform plate boundary. Most plates diverge (move away from each other) at mid-ocean spreading ridges. The mid-ocean ridges are undersea mountains more than 12,000 feet high and 1,200 miles wide. Molten rock moving upward by convection reaches the surface along these ridges and releases much of the Earth’s internal heat. Near the surface, the oceanic lithosphere is mostly basalt, a black, fine-grained volcanic rock. 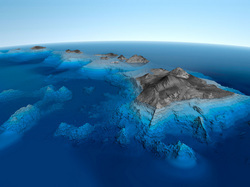 The Hawaiian Islands* are our best-known modern examples of hot spots derived from mantle plumes. Another well-known example is the hot spot beneath Yellowstone National Park today. As we’ll see, hot spots have played a major role in creating some of Washington’s volcanic regions. *Update: See scientists' latest views on the creation of the Hawaiian Islands at the end of this article. A subduction zone is a boundary where two tectonic plates collide and, because of differences in density, one dives beneath the other. Plates carrying oceanic rocks move across the face of the planet until they run into an obstruction, typically a continent. Continents are made of lighter rocks such as granite. When the two plates collide, the heavier oceanic rocks sink downward (are subducted) underneath the lighter continent. Where the ocean plate dives underneath the continent, a deep trench forms adjacent to the edge of the continent. Trenches within subduction zones are the deepest depressions of the Earth. When the floor of an oceanic plate subducts beneath a continent, high pressures, high temperatures and high water concentrations combine to melt some of the lighter minerals in the descending plate. These molten rocks form bulbous bodies (like in a lava lamp) of silica-rich magma called “plutons,” named after Pluto, the Greek god of the underworld. Many plutons never reach the surface. Rather, they cool and crystallize into bodies of granite deep beneath the Earth’s surface. Some plutons, however, make their way to the surface and erupt as a chain of volcanoes rising along the edge of the continent. Geologists call the arc-shaped belt of plutons and volcanoes a “continental arc.” The modern Cascade volcanoes are a classic modern example of a continental arc. The illustration below shows how all three types of plate boundaries (convergent, divergent and transform) operate as part of a vast global system. New oceanic lithosphere forms at divergent plate boundaries such as mid-ocean spreading centers and continental rift zones. The lithosphere and oceanic crust descend along subduction zones located either at continental boundaries or in convergence with other oceanic crust. In both cases, a volcanic arc at the surface reflects the partial melting of the subducting slab at depth and the upward movement of magma bodies (plutons). The creation and destruction of oceanic lithosphere occur at about the same rate on a global scale. As the continents have moved through time, they have repeatedly collided to form “supercontinents.” Most of the rocks that make up continents are insulators -- they are reluctant to transfer thermal energy. Eventually, heat builds up beneath the continent. The continental crust swells, stretches, and finally ruptures. New ocean floor begins to build within the rupture zones. Fragments of the supercontinent spread as the ocean plate grows along a new seafloor spreading center. Because the Earth is a sphere, the moving continental fragments inevitably reassemble about every 500 million years. As we will see, the creation and destruction of giant continents has played a major role in the geologic history of Washington and the Pacific Northwest. The most recent supercontinent was Pangaea. It formed about 300 million years ago when the isolated continents collided. The creation of Pangea meant that only one large continent existed on the Earth, balanced by one large ocean called Panthalassa (Greek for "all seas"). Beginning about 230 million years ago (and still going on today), the present Atlantic ocean formed and began spreading. Pangea broke apart completely, and the continental fragments are now scattering across the globe. The modern Atlantic Ocean is spreading at the expense of the Pacific. As North America moves westward, the Pacific Ocean basin is getting smaller along subduction zones (convergent plate boundaries) under North and South America, and Japan, as western North America and Asia get closer together. Sometime in the future the Pacific ocean will close completely and Asia and North America will collide to form yet another supercontinent. Before Pangaea, yet another supercontinent called Rodinia existed between 1.2 billion and 750 million years ago. It also formed from the accumulation of isolated continents, only to fragment 350 million years after its formation. There is growing evidence that even older supercontinents predated Rodinia early in Earth’s history. This supercontinent cycle – the assembly, rupture, breakup, spreading and reassembly -- has left an indelible record on the geology of the Pacific Northwest. The modern geologic time scale, widely used in North America. Geologists think of time very differently from most people. The Earth is nearly 4.7 billion years old. Washington’s geologic history goes well beyond a billion years. The most recent plate tectonic cycle that built the Pacific Northwest began 200 million years ago. Clearly, we need a different type of calendar to order geologic events that occurred so long ago. The geologic time scale has evolved over the last 200 years as geologists began to order events in Earth history. The geologic time scale developed in the 1800’s, based on the history of life preserved in fossils. Each division of the time scale marked significant changes in the fossil record, such as the extinction of certain life forms and the appearance of new ones. Since the 1950’s, the modern science of geochronology has used the decay rates of radioactive isotopes to put absolute ages on the geologic time scale. The time scale is a working document, often amended in detail as our ability to date rocks improves.